New drought record- no tornadoes so far this year in Oklahoma | Watts Up With That? Oklahoma tornado drought to start 2018. If there is one state in the country that immediately conjures up images of tornadoes, it has to be Oklahoma. After all, it’s the home to NOAA’s Storm Prediction Center and the National Severe Storms Laboratory, and it’s located in the heart of “Tornado Alley.” Oklahoma normally sees about 62 tornadoes per year. This year, through the end of April, that number was 0. 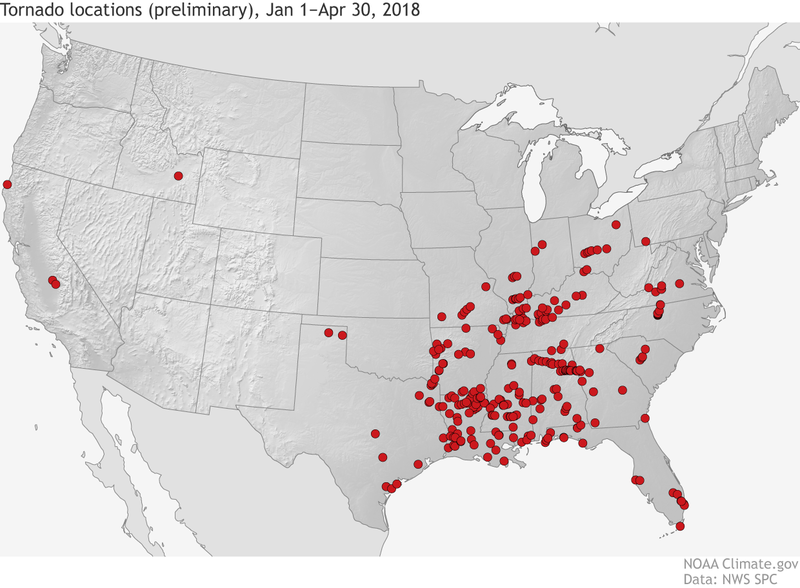 The location of tornadoes across the United States from January 1 through April 30, 2018. The tornado data was taken from storm reports from the Storm Prediction Center and is preliminary. During the first four months of the year, not a single tornado formed over Oklahoma. The first tornado of the year for the state finally occurred at the beginning of May, setting a record for the latest first tornado of the year. Climate.gov image using data from the Storm Prediction Center. That’s right. Zero tornadoes formed in Oklahoma from January through the end of April. This marks the state’s longest wait on record for the first tornado of the year (a wait that preliminarily ended on May 1). Before 2018, this record was held by the year 1962, when the first tornado of the year hit on April 26. That record posed no problem for this year, as 2018 became just the third April since 1950 with zero tornadoes, and the only year with no tornadoes in January, February, and March as well. While it may not be surprising that January and February were quiet months, as tornadoes are generally not common during winter, the lack of activity during early spring is uncommon. From 1991-2010, Oklahoma normally has had to deal with five tornadoes in March and 11 in April. That April total represents about 18% of 62 tornadoes seen on average every year. Is the lack of tornadoes country-wide? Not surprisingly, a lack of tornadoes in Oklahoma also coincides with a below-average number of tornadoes country-wide so far in 2018. Preliminarily, around 270 tornadoes have formed so far in 2018, a number which is around 230 tornadoes below-average. But this year is still running above some previous low-tornado years like 2013 and 2015. So where are tornadoes occurring? Mostly in areas farther east in the southeastern United States. States like Louisiana (49 tornadoes), Mississippi (37 tornadoes), and Alabama (34 tornadoes) have seen an above-average number of tornadoes so far this year through April 26. The difference from average temperatures (degrees Fahrenheit) for the contiguous United States during April 2018. Much below-average temperatures were observed across much of the country during April, with only the western United States seeing temperatures above-average. Climate.gov map using data from NOAA’s Climate Prediction Center. Simply put, the atmospheric set-up across the southern Plains in early spring was not great for the formation of the severe thunderstorms needed for tornadoes. These thunderstorms generally need an unstable atmosphere to allow air to rise easily, a sufficient amount of moisture to provide energy for the developing storm, and finally, something to force the air to rise in the first place. These ingredients were hard to find in April as below-average temperatures hung over much of the central United States, decreasing any chance for severe weather. The one area where warm, moisture-filled air was plentiful was the Gulf Coast, tapping into the warm waters of the Gulf of Mexico. Subsequently, the focus of severe weather shifted farther east, leaving the normally increasingly active tornado season across Great Plains dormant. From March to June in a “normal” tornado season, the best chances for severe weather shifts steadily from the Gulf Coast to areas farther west and interior in the Great Plains. This transition follows the flow of warm, moist air from the Gulf of Mexico as it penetrates into the middle of the country. In winter, the Gulf Coast can remain warm and moist due to its proximity to the Gulf of Mexico, allowing for severe weather to still form. But as the temperatures warm throughout the spring, the jet stream—an area of high-altitude, fast-moving winds that reflect a boundary between warm and cold air— and the risk for severe weather move north into the interior of the United States, entering a region colloquially know as Tornado Alley. Daily historic probability of severe weather within 25 miles of each map grid point during a 30-year base period for March 1-June 30, the peak of the yearly tornado season (April-June). Darker colors represent a higher number of severe weather reports. As spring progresses, the highest chance of severe weather spreads north and east across the Plains, the Midwest, and Southeast. Map by NOAA Climate.gov based on data from the Storm Prediction Center (SPC). Individual maps available from Data Snapshots. Regardless of past activity, it’s still necessary to be aware of tornado risks! It’s important to remember that the tornado season still has a ways to go in Tornado Alley. We haven’t even reached the peak yet, which usually falls between May and early June across the southern Plains, including Oklahoma. But still, even in a tornado season with a below-average number of tornadoes, it just takes one storm to create a strong tornado. May 4, 2018 in tornadoes. Good article. However, “If there is one state in the country that immediately conjures up images of tornadoes, it has to be Oklahoma.” I would say Kansas. So would Dorothy and her little dog too. Been to Oklahoma three times and only saw one tornado. So there’s a data point for you. No, Oklahoma. Mention May 3rd, and everyone knows. https://en.wikipedia.org/wiki/1999_Bridge_Creek%E2%80%93Moore_tornado, we forget the dates of the ones since and just reference the destruction. Kansas tornadoes has the movie, but Oklahoma is second on to Texas, and only for being so much less in land area. I guess it’s just the Oklahoma City has been hit by several big out breaks including a massive F-5 during that time period and so it in the news that makes people think of Oklahoma when on talks about tornadoes. That’s the average number per year per state. Something else I find interesting is that we have many more weak tornadoes of the EF-0 and EF-1 categories reported in recent years. Kudos to NOAA for attempting to put the inflation in the count resulting from the ever increasing Doppler Radar coverage, increasing population in general and it’s dispersion and the increased number of trained spotters, in historical perspective using an adjusted tornado count. Also according to the same source. Here is the ranking of the top states for average number of tornadoes per year per 10,000 square miles of area. I live in East Texas – the bottom end of Tornado Alley – and we’ve all been commenting on how, even though it’s the first week in May, the weather pattern still feels like a typical late March. Nothing at all what usually rolls through here this time of year. There were 5 EF4 -EF5 ( the Moore EF5 )twisters within 10 miles of Norman Oklahoma. in the period 2010-2013. In addition there were, as I count, 12 EF0-EF2 tornadoes in the same area, including the EF1 that went through the center of town in 2012 and a couple more inside the city limits. So our reputation for tornadoes is well supported by more than the single Moore twister. I would prefer, however, that we not continue to live up to it – enough already! I appreciate all the comments here. Thanks for pointing out the average numbers for correction. Note, though, https://en.wikipedia.org/wiki/Tornado_records Reference how many times Kansas appears and how many times Oklahoma appears. Kinda significant. Kansas has had its share, but most of the bad ones are before most can remember. https://www.weather.gov/ict/toptenkstors The 1966 Topeka twister is noteworthy. It’s simple it’s due to AGW. An anomaly, no tornadoes = extreme weather. Extreme weather caused by global warning QED, I have earned a coffee break. Yep.. ‘Tis Climate Change™©® wot dunnit..
Oops! A butterfly just flapped. Tornado on its way. There goes another Hansen et al theory. Wallaby – I think you are right. This is an extreme. And remember, it doesn’t have to be AGW. An acceptable answer is Climate Change. This LOOKS like a change to the norm. We are doomed. By a lack of tornadoes, this time. The religion of AGW could develop a calamitous story of how this is a disaster. I look forward to it. After all, they found the downside to more CO2 (plant food). It’s all in the models. We are doomed. Thank Mann. Sorry – I meant Thank God, I’m sure Mann will appreciate my error. I’ve lived in Southeast Kansas and Northeast Oklahoma for 54 years. Never seen a tornado and certainly not for trying. But there are plenty in both states every year since I remember. Our children won’t know what tornado shelters are. Sure they will – that’s where they will hold their keggers! By the map, Kansas had none, too. There it is once again, proof of global warming, or climate change, or whatever the phrase of the week is this week. To make it simple, everything proves global warming. Actually, it is ‘proof’ (at least as much proof as the AGW folks usually require) that the large amount of [nearly fatal] global warming we have been experiencing has CAUSED the tornados to abandon Oklahoma! YEAH AGW!! Go check out Wunderground comments. Every day it’s “Any day now”, “Oh that looks interesting”, “Maybe tomorrow”, etc, etc, etc. Then there is the same angst over the lack of any hurricane formation as of yet. They are dying to have the first ones appear. Several stated harping about eh monster heat record , sure sign of climate change, in Pakistan last week. I wonder if that record wasn’t p;pushed up a bit with a thumb on the scale somewhere. It’s a bit of a mix of people over there. There is a percentage who can converse, and then there are the virulent true believers. This article prompted the strangest thought. Are all those wind farms even being built in the right places? Will there even be any wind left at all? Has anyone modeled this? Our children won’t know what wind is. Unless, of course, they pass it! It must be a pleasant sensation because they always giggle! Oh, Oh! That must be it. All of these wind turbines that have sprung up all over the place must be the reason why we have such a late start with tornadoes. There is a perfect reverse correlation. A big Thanks to all of you scary climate story tellers. All of the increased cost of my electric bill directly pays off in fewer tornadoes. There will still be wind, albeit abated. But birds and bats, none. A tornado would have to had worn a down jacket, just to stay warm in Wisconsin this spring! So, the new theory is that the fear of down jackets caused the tornados abandon Oklahoma? The article cited cooler spring temperatures as part of the reason. Yes, cooler weather was definitely a factor in Oklahomas lack of tornadoes. This April was one of the coolest on record. As of today, May 5, Oklahoma has had eight tornadoes. Yes, cooler weather. The annual USDA last- frost date is listed as April 15th, but we had a killing frost this year on the 16th, in Central OK. The latest frost date in many years. More energy in the global circulations results in colder winter outbreaks in the planet’s storm tracks. Other weather windows are warm enough for people to remark about. Warmists will find a way to spin this into something bad. implied sarc tag detected, LH. As you know, when there is a lot of tornado activity or hurricane activity, they talk about the extra energy available for violent storms derived from CAGW. When there is no activity, they refer to the theory that CAGW predicts a smaller temperature gradient between the poles and the tropics, thus less wind. Barring that approach, any lack of tornados is “just a weather pattern”, whereas any single tornado is evidence, nay proof, of catastrophic anthropogenic global warming. That’s Climate Change (TM). Any time it’s warmer, cooler, drier, wetter, windier, calmer, quieter, noisier, more war-prone, (never more peaceful), that’s due to Climate Change (TM) and 105% of Climate Change (TM) is caused by eeeeeeevil unregulated human activity. There’s only ever one solution to any problem with this crowd, a bigger, more-intrusive state that by pure coincidence they will administer, since they are the experts. Now you should not unreasonably assume that just because they will be the overlords that they will, you know, lord it over us. Check your paranoia, please. They are only doing this for the children! The Storm Chasers may be frustrated but not the television viewers. Some of our local weather stations have started showing video of storm chasers hundreds of miles away, chasing storms hundreds of miles away, if there is nothing going on locally weatherwise.. This anomaly is unprecedented and much worse than previously thought. C02 has created severe tornado drought. When the tropopause rises they will start. The season starts when it rises, and intensity again when it descends, that is why tornado season moves up the country and down again during autumn. Ren has been posting tropopause height, higher density of ozone charts at various sites. The ozone is dense because the tropopause is low, it dilutes when it rises. That’s my theory. It may be wrong, or not. So this year there’s no big masses of warm gulf air heading north – It’s still fairly cool and dry across tornado alley, and so as cold fronts come down, nothing interferes with them and they just roll on through, just some rain, no big storms. We just had another the last couple days, no news because it was so average, but exactly a year ago there was a bad spawn of tornadoes this week that killed 6 people about 30 miles from me. 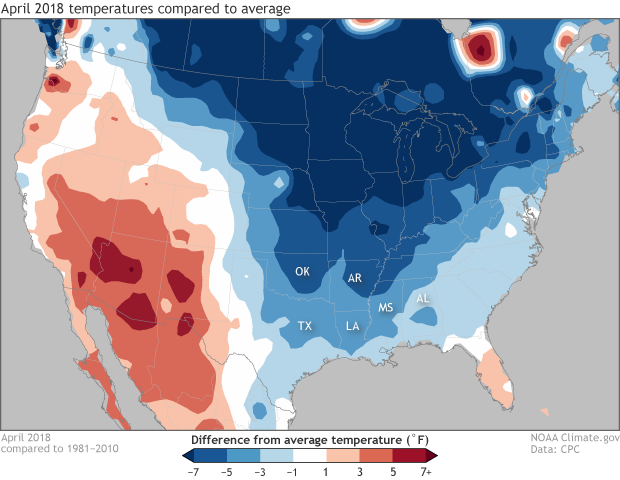 So long and short, it’s an unusually cold year, and that’s what’s killing all the Tornadoes. wws – this season has been cool in KS, OK etc. but not farther west. So clearly, Oklahoma tornadoes cause sunspots. Oklahoma had small tornadoes early this week. Perhaps the inspectors declared them other than tornadoes, but it sure seemed we had some touchdowns and F1, to maybe F2 damage. No supercells. Our excitable weather folks kept pointing out how spins would develop quite suddenly, run for a few minutes, and wear out. Sirens sounded in several communities across the state on 02 May 2018. I suppose the article specifies 30 April, but the headline says so far. We had small tornadoes two days ago. I think of Kansas and tornadoes. So who is gonna sue ExxonMobil over a lack of tornadoes? There is always some record somewhere. To be significant this particular record would have to have been predicted in these circumstances before it happened. It appears the tornado drought is due to a cooler Spring. In 1982 I installed an ICF system called Polysteel on my daylight basement, Cedar Log home in NE Pennsylvania and installed them on basements of all the kit homes that I sold as a distributor of several manufacturers including Lindal and Viceroy Cedar Homes. The ICF systems evolved over the years including Reward Wall and others including yours which unfortunately I am unfamiliar with. Recently at a Log Home Show I was introduced to https;//www.foxblocks.com which have many improvements to the ICF Systems that I used in the past. I’m retired but would love to try this system. As a fellow PE I agree with your assessment that Codes in Tornado/Hurricane prone areas need to be modified—good luck with that as stick-built construction is all most builders are familiar with and they will not be that receptive to the change and they have political clout. There are stumbling blocks on rebuilds since Insurance Companies in the US will not allow any substitute replacement construction only but was in place before the natural disaster occurred. DUMB. My current retirement home is in a wind prone area. It is a hybrid of Timber-Frame roof and cross-tie beams, SIPS ( structural insulated panels-roof ) with standing seam metal roof and ICF walls. ICF is finished inside and out with Drivit epoxy stucco. SIPS have been used successfully by others including Pulte a major US Builder to overcome natural disasters you refer to. Now if we can only keep trailers out of flood and tornado/hurricane areas. Thank you Bigfoot – good post. I live in Oklahoma and had an unusual experience with this last storm front that came through a couple of days ago (and delivered Oklahoma’s first tornadoes of the year. I was sitting here in my living room watching tv and looking at the computer while a fairly tame storm with very little lightning was in the area and all of a sudden a lightning bolt seemed like it hit the ground right outside my window. It sounded and felt like a bomb had gone off. I jumped about six inches off my chair as the huge explosion occurred. The funny thing was none of my electrical equipment was cut off by the bolt, but I started smelling a burnt insulation smell so I got up and looked around behind my computer monitor and saw about a two-inch high flame coming out of the back of my computer modem! I put it out fairly easily, but I guess my house would have burnt down had I not been sitting right there when it happened. The lightning bolt must have generated a current in the RG-6 cable that goes from my satellite dish to my modem with enough power to cause the plastic coating on the RG-6 cable to burst into flames. I was flabbergasted. And lucky. Your comment made me think of something. Not related to tornadoes but lightening. Has anyone here used grounded barbed wire to prevent/reduce lightening strikes? Nope, but the main part of my house here about 35 miles NNE of Indianapolis was built in 1943. When I put on a new roof about 8 years ago I had them put back up the old copper lightning rods connected to a copper cable ground. It was a good decision as 5 years ago we had a strike. The only damage done was to the submersible well pump which I had to replace. For what ever reason the copper stake the ground cable is connected to goes into the ground right next to the ” Pit less” adaptor over my well. Last spring I had another strike that pealed to bark off of one of the western pines that is located only 20 yards from where I am sitting now. I was on the computer at the time of the strike reminded me of what it sounds like when a 130 mm artillery shell lands close. The sound was very similar though the concussion was much less. The hair stood up on my arms and the smell of Ozone was very strong. The strike took a strip of the bark off the tree from nearly the top all the way to trunk at ground level. The tree seems to be doing fine though. My comment is based on my use of grounded barbed wire. I haven’t had a damaging strike since installing, but that doesn’t mean it has eliminated a strike. Got the idea from college physics class and the Van de Graaff generator. The static charge was bled off when a pointed spike was placed on it. So I tried it, not much to lose. Cheap insurance? I just wish I really knew for sure or if it’s no more effective than my “lucky rabbit’s foot”. But that brings up the question as to how lucky was the rabbit. So many questions. Just one more thought on the barbed wire. About 10 -15 years ago I was on a fishing excursion in the Chesapeake Bay. Set up on small island no more than 1-2 acres. Steel posts had been installed to mark boundary for nesting birds. Anyway, a pretty nasty storm developed a couple of miles north of us with lots of lightening. We (four of us) were preparing to evacuate but the boats were a jonboat and a catacanoe (two canoes joined with oak planks off the barn and a 1 hp outboard engine) and then the wind was way too much for the 2 mile open water trip to real shore. Well, we had the fishing poles (graphite) in pvc sand spike tubes and sparks and static electricity was keeping us from grabbing the poles and they were really crackling like fish frying. Of course I had my pre-coiled barbed wire, about 15-20 ft length before coiling, and grabbed it and made a dash to slide it over one of the island’s bird markers and we got the fishing poles down and into the aluminum jonboat with tips sticking up and moved about 30-40 yards away. Anyway, I’m writing this and there were no strikes on us. Did the barbed wire work? Don’t know, but I didn’t have my “lucky rabbit’s foot”. In a neighbor’s house here north of Houston, one July 4th, while the owner was gone, a lightning bolt hit the house, and burnt it to the ground. Upon going through the rubble, the flat screen TV was found to have a 6″ circular hole in the screen. The arson inspectors thought that the bedroom electronics were proximate cause of the fire after the lightning strike. Lightning struck my car in a heavy rainstorm, in Stillwater, OK. It hit directly above the driver’s set and burnt a small hole in the steel, with the metal rippled into concentric rings for about 1.5″, then the paint had concentric rings burnt across the top of the car, and all with lines radiating from the strike point. Reminded me of a seashell, like on Shell gas station signs. I was in the house at the time, or the driver’s seat would likely have been ruined as well, from a giant pucker mark. So much for the theory that cars aren’t hit because of the rubber insulation of the tires. Could it now be the steel belts provide sufficient ground? Thankfully you weren’t in it!! Well, since the middle of the US was colder and delayed tornado season I would guess the gulf might have stayed warmer than normal. I’m expecting the alarm to be sounded for an increase of gulf hurricanes this season. People think of post Clovis Native Americans when you say OK. KS brings tornadoes to mind, which also broke the record for the latest forming tornado this year. Wow when the show Oklahoma sings “Where the wind comes sweepn’ Down the plain “ takes on a new meaning to me because of that graphic.